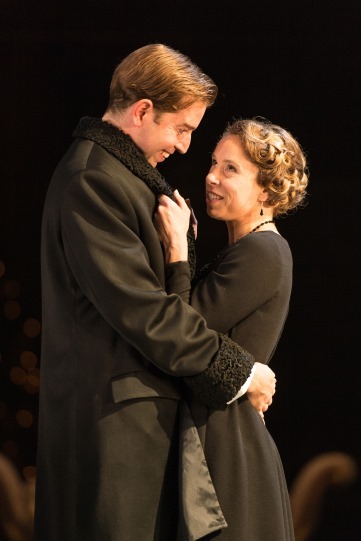 So Much Ado About Nothing is probably my favourite Shakespearean comedy of them all; despite the amazingness of the characters in Twelfth Night, As You Like It and A Midsummer Night’s Dream, no one can live up to the sparkling wit of Beatrice and Benedick. 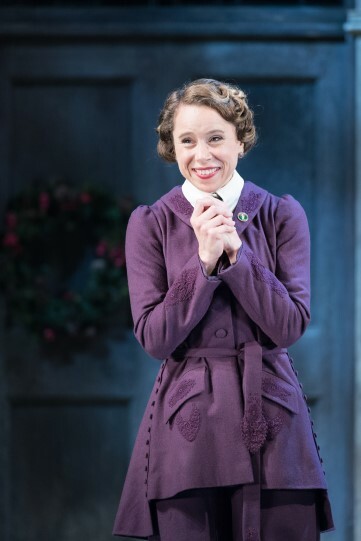 When I see a bad Much Ado, therefore, it’s like someone cancelling Christmas on the evening before – so much anticipation, and then so much disappointment (remember this Old Vic production?!). 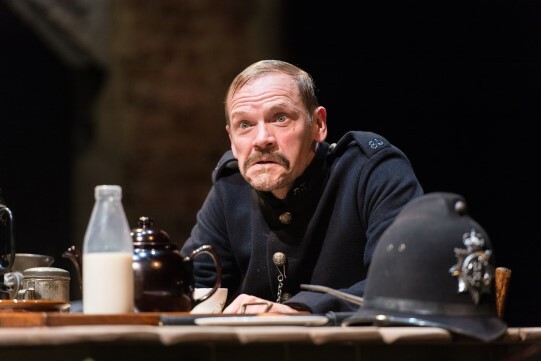 Luckily, the RSC’s current production up in Stratford-Upon-Avon is absolutely worthy of the brilliant script. 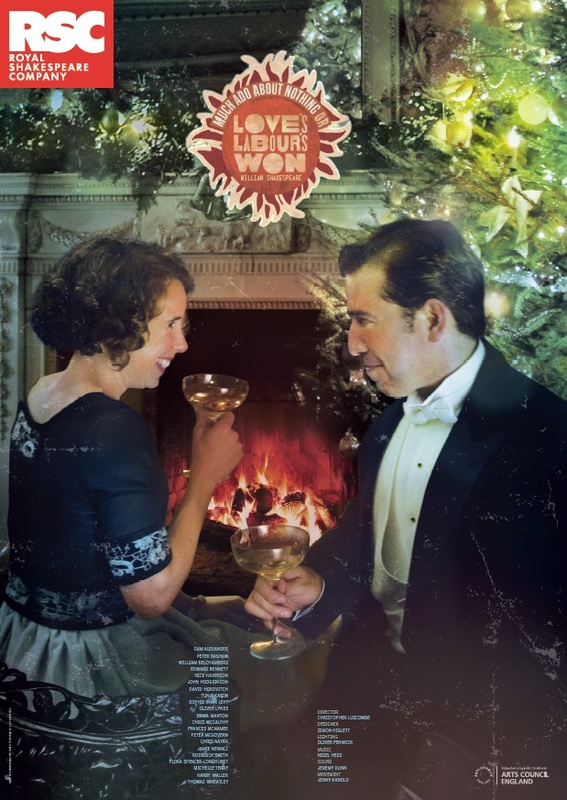 Marketing it as ‘Love’s Labour’s Won’ to partner Love’s Labour’s Lost (which I’ll hopefully be going to see in February), the two leads are perfectly cast in this sparklingly funny, yet moving, festive piece of theatre. I’m really excited to see the two together again in Love’s Labour’s Lost; they were the perfect double-act. Naturally, these two parts are the most important by far in this play, but Terry and Bennett were supported by a very strong cast (as is usual with RSC). Flora Spencer-Longhurst was sweetly convincing as Hero, with Tunji Kasim charismatic and gullible enough to just about get away with playing the confusingly nasty, yet romantic Count Claudio. 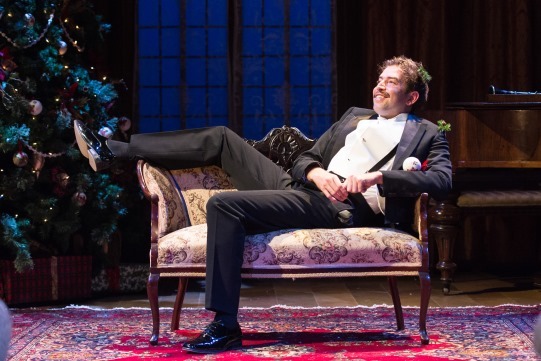 I also liked John Hodgkinson as Prince Don Pedro, everyone’s favourite matchmaker, and it was lovely to have a person – Harry Waller – who could properly sing and play piano as Balthasar. The actresses who played Margaret and Ursula (Emma Manton and Francis McNamee respectively) also made the most of their small parts. Apart from the two protagonists, Dogberry is the only other major character in Much Ado, and he’s also one of the most problematic. Your stereotypical Homer Simpson style slapstick fool, it’s a part difficult to balance between completely ridiculous and genuinely hilarious. Nick Haverson made a good stab at being the ludicrously pompous, stupid constable, producing gales of laughter from the audience with his disgusting spitting (how does one man produce that much saliva?!) and some great farcical scenes. However, I do feel like I still haven’t seen an actor that’s truly got Dogberry; for me he should be played completely straight. So much of the comedy – in fact perhaps all of it, since we don’t have any stage directions in the script – comes from the lines and the hapless constable’s malapropisms and misunderstandings, yet no one ever gets to hear them properly because the actor is trying so hard to create his own comedy. It’d be great to see someone play it completely straight, to show just how seriously Dogberry takes himself. Still, it’s not like this production failed or anything, it just wasn’t quite as funny/gripping as the main plot, which I thought was a shame. 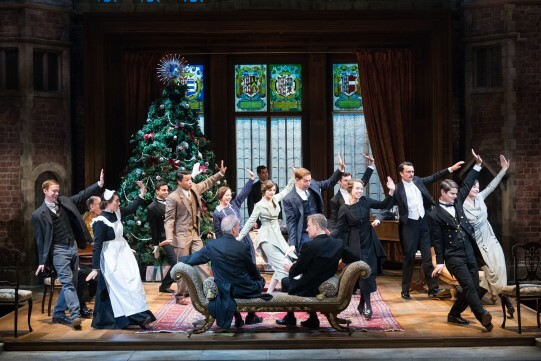 The setting of this production is absolutely lush; set in an English stately home, either during or just after WWI, at Christmas time. As possibly the most festive person on the planet, I very much appreciated the aforementioned massive Christmas tree and the cosy, carol-singing, sherry-drinking atmosphere that permeated the air, even in the auditorium as well as onstage. 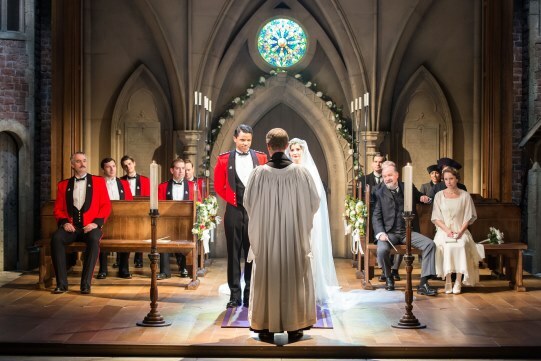 We are transported effortlessly from a drawing room to the gardens to Hero’s bedroom to a country church, and it works together with the music to make a lovely atmosphere. Basically this is a really warm and inviting production with two superb leads who definitely carry the play on their capable shoulders. A perfect show for Christmas, for comedy and romance, and for drama; whilst the Dogberry scenes aren’t quite as hilarious as they could be, they still elicited a great big response from the audience and the ending is beautifully sentimental without being cheesy (although I love a bit of cheese, so who am I to judge?!) A show that will leave you hugging yourself with happiness. Hi Alice, we are friends of Wayne and Debbie’s who put us on to your Blog/ reviews. Delighted with this posting: we saw both LLL and this and loved them both. The ‘liet motives’ running through both productions were excellent. The Maxwells know what name-droppers we are, but I thought that you might be interested to know that we are having lunch with Christopher Luscombe tomorrow! Hi Bruce, thank you so much for reading my reviews! Glad you enjoyed the productions too. I’m so excited to see LLL in February – will certainly write a review of that as well! Wow, that is so amazing – I saw his production of ‘When We Are Married’ as well, and loved that. Hopefully one day I can meet him myself – maybe get an interview or something haha!